Quinn is a 1 year old Australian Shepherd. Her first visit to Animal Health and Hydro was February 2018 when she was 8 months of age. In October 2017 Quinn suffered a fracture of the right femoral neck. This was repaired using pins and the recovery was uneventful and the operation a success. 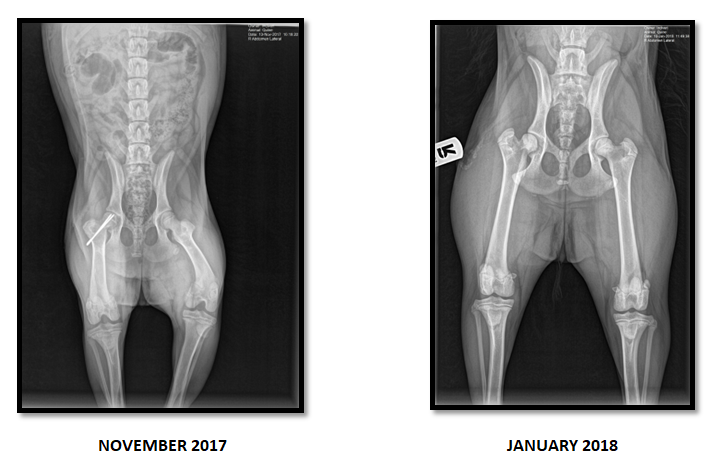 Early in February 2018 Quinn presented at the specialist vets with a ⅕ left hind limb lameness. There was pain on extreme hip extension and with palpation of the iliopsoas muscle bilaterally. Quinn was referred to Animal Health and Hydro. Three points are checked on each side to determine whether ot not there is an iliopsoas strain. All three points on each side were painful. There was also pain on palpation of transverse lumbar processes. Aside from the obvious discomfort during hip extension (bilaterally) Quinn’s musculature generally felt underdeveloped and with a low tone. Quinn’s guardian had been very careful about restricting the pup’s exercise so as to allow for complete healing of the fracture. It was extrapolated that this restriction resulted in less development of musculature than would be deemed normal for a growing dog. 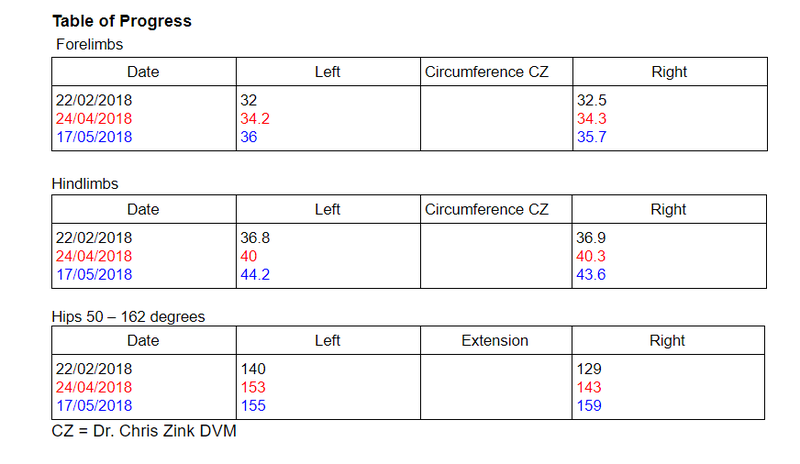 Goniometry and thigh circumference were measured. See Table of progress. The goals of therapy were to reduce pain, improve general muscle tone/strength and to return to normal mobility. The client wanted a normal, healthy and happy dog. A 12 week program was discussed with a reassessment at 6 weeks. When rehabilitating soft tissue injuries it is vitally important to manage movement. Any opportunity the dog has to run or jump potentially re-injures the site. This is carefully explained to clients so there is an understanding of how important movement restriction is. The restriction is not cage rest but rather controlled and managed movement and exercise designed to facilitate healing and then to improve the strength at the site of injury. Finally, the focus is on return to function and activities of daily living. Each phase of repair takes 2 - 4 weeks and exercises are only increased in duration and difficulty if the patient has not shown any signs of regression in the preceding week. The initial focus was on managing pain and inflammation. Added to this were modalities and exercises which enhanced tissue repair. Photobiomodulation was performed by the client everyday, as well as application of heat to the injured area. Exercises followed and included very low elevated stands (front paws on a book) to encourage active hip extension in a static exercise. The progression of this is to add lateral neck flexion exercises or to increase the elevation. Quinn was to be leash walked 4 - 6 times per day. If she showed any lameness whatsoever, the distance/time of the walk was deemed to be too much. Quinn was only introduced to the underwater treadmill after 6 weeks of slow, progressive land based exercises. Home exercises became more challenging but always performed in a controlled manner. Quinn was still not allowed free access to the garden. After 8 weeks there was no pain on palpation of iliopsoas muscles. The hip extension had improved and Quinn had increased muscle mass. See Table of progress. The goal for the next month was to continue to strengthen the iliopsoas region, teach dog and guardian how to utilise their pool to the best they could and to build on the home exercise program (HEP). Quinn could now be trotted, on lead for 60 - 90 second bursts. By the end of May Quinn was completely rehabilitated. The success of this patient’s rehabilitation lay in the client’s understanding and buy-in of the need to manage Quinn’s movement. Furthermore, there was diligent participation in the HEP with frequent questioning as to whether or not the exercises were being conducted effectively. The dedication to attending out sessions at AHAH was 100%. The relationship that developed between human and dog was beautiful to watch. Our entire team was involved and are in agreement that we all learnt a great deal. Our thanks to Quinn and Tamaryn.